The answers to the question of "Who's in?" have been reveled. In the inaugural year of the College Football Playoff, the final four teams will be Alabama, Oregon, Florida State and Ohio State. Oregon will play Florida State in the Rose Bowl and Alabama will play Ohio State in the Sugar Bowl on New Year's Day. The first two teams out were Baylor and TCU. With this afternoon's announcement of the final rankings from the College Football Playoff selection committee we have realized something that many of us have known was going to happen: the weekly rankings the committee have done the last seven weeks have been proven to be irrelevant. As to Ohio State getting in over Baylor and TCU, I don't have a problem with them being that fourth team and can see the reasoning even as I don't agree with it. Jeff Long, the committee chairman, said that the difference was Ohio State's omnipotent performance in the Big Ten Championship Game on Saturday against Wisconsin as well as them playing in a 13th game itself (which could be spun many ways). Of course, one could have thought that the committee was going to judge the entirety of the teams' seasons and thus factor in Ohio State losing by two touchdowns at home to Virginia Tech in September or some less than impressive wins over mediocre conference rivals like Penn State, Indiana and Michigan. I think that Baylor had a better overall profile than Ohio State did with better wins, a better loss and being in a better conference, albeit one without a conference championship game (and the "co-champions" idiocy of the conference certainly hurt their case) and with a pretty shabby non-conference slate. But even, Ohio State being in is not egregious. 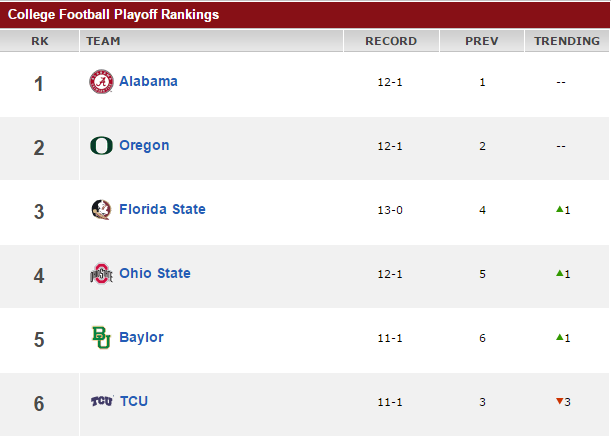 As you can tell, TCU was third a week ago. All they did on Saturday was beat Iowa State 55-3 and for that, they drop three spots behind Florida State (beat Georgia Tech by 2), Ohio State (beat Wisconsin by 59) and Baylor (beat Kansas State by 11). It that does not make sense, well, it doesn't. What caused Florida State, who had been gradually sliding in the playoff rankings since debuting in second, to pass TCU when TCU had passed them the week before? Yes, Florida State is unbeaten but that was the same situation a week ago! And if Baylor passed TCU because of the head-to-head result, why had TCU been ranked ahead of Baylor during every ranking prior? If the answer of the committee is that they redo the rankings every week from scratch, then there should not be rankings in the first place. The fact that there was this pretty inexplicable shakeup in the rankings further confirms that there is no purpose to these weekly rankings. If there was, how does TCU fall three spots for winning by 52? I would scrap all of the weekly rankings altogether. I do understand the reasoning towards doing only a few sets of rankings but I would rather them not deal with them until this week. Even as Long has done interviews every week giving the committees' justifications for their rankings, the justification process is still relatively vague. In my humble opinion, getting rid of the weekly rankings takes out one potential headache for the selection committee and it is head-scratching shifts like the one we saw this week.